This will provide you with a 5-8 page document customised to your VARK scores from the Teachers’ Preferences Questionnaire. It describes some data on Students’ learning preferences and some data on Teachers’ learning preferences so that comparisons can be made before reading about your own Teaching Preferences. 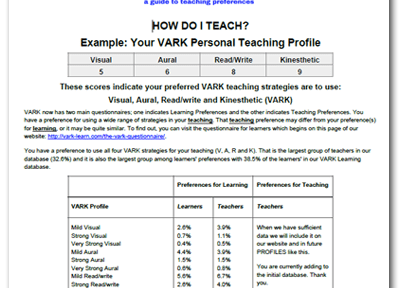 VARK Teaching Helpsheets are provided along with a discussion about other ways to measure or indicate your teaching and training preferences – peer observation, student/trainee evaluations, video analysis … The strengths and limitations of each method of indicating teachers’ preferences are also listed. A tombstone task ends the profile as an exercise in how we are yet to effectively measure when, and how, learning occurs.